Now is the time of year when you’re about to get ready to go into the fall season. That means your spring cleaning is done, you’re having summer fun but you need to get prepared. How are your sleeping habits? Are you comfortable? Do you have back issues? Could it be your mattress? It may be time for you to get a new mattress, and you can do that when you use one of these discounts from this MULTI-SAVINGS DISCOUNT COUPON FROM BEDDING EXPERTS. That’s right! Bedding Experts is giving you the chance to get your bedroom in order and sleep just a little bit better. We could all use a good mattress in our lives. You have a choice of four discount coupons. Man, that’s significant savings, and they’ve provided one that could meet any need. $50 off a twin mattress set, $75 off a full mattress set, $100 off a queen mattress set, and $150 off a king mattress set. There’s definitely something for everyone. 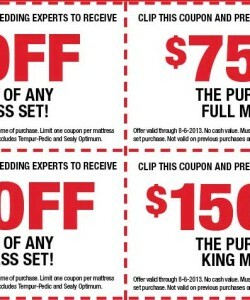 If you’re looking to furnish an entire set of rooms, the savings you get from using these coupons will be enormous! It’s definitely the summer, because stores are getting rid of inventory and giving significant discounts left and right. OMG! Do I need a new mattress??? Even if you can’t use the discounts spread the good word to your friends. You never know who may be looking for a new mattress set and I’m sure they will appreciate your generosity in helping them to save a little money. Every dollar saved is more money that can be used toward other household goods. Pinching pennies does work.